Buxton showing their superiority during the cup final. Rampant Buxton added to their pleasing league season by lifting the Nottinghamshire, Lincolnshire and Derbyshire (NLD) Plate with an emphatic 41-16 victory over East Retford. The Stags, who finished a creditable fourth in the Midlands 3 East (North) division of the National League, were too strong in the final for their underdog opponents, who play a level below them. Captain Josh de Groot’s troops seized the momentum straight from the kick-off with a devastating tackle that led to an early scrum and subsequent penalty. A potential early three-point lead was turned into a five-point lead after three minutes when some quick thinking by Greg Mellor led to a quick tap-and-go to score. The resulting conversion was missed, but Buxton’s early dominance continued with Sim Meek driving over off a well-worked lineout move. This time, Matt Lomas kicked the conversion to give his side a 10-0 advantage after 15 minutes played. The lineout superiority continued with a switch in jumping positions. 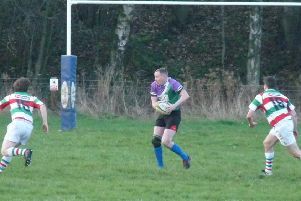 Conor McHale took the catch from some first-class lifting by Ben Rosamond and Company for Paul Storer to drive over from the resulting maul eight metres out. Lomas stepped up for a huge conversion out wide to give the Stags an almost unassailable lead of 17-0. The backs were in the limelight next, through the middle, with Dean Wagstaffe dictating the play and Ben Austin carving a gap. Lomas again converted to increase the lead to 24-0 minutes from the half-time whistle. Retford were left reeling from the onslaught, so credit to them for gaining some field position and taking a penalty to reduce the deficit to 24-3 by the turnaround. The second half started as the first had ended with a Retford penalty, after some defensive indecisiveness by Ryan Sircar following a deep kick-off, poorly dealt with by the Stags team. However, Buxton were soon in full flow again, and Mellor struck again with a 50-metre effort from a injudiciously-placed Retford kick five minutes in to further extend the lead to 29-6. With the game all but done and dusted by now, the Stags emptied the bench, taking off Mike Pullen and Dan Corthorn after excellent performances, with the aim to get all the squad some cup-final rugby. The resulting disruption allowed Retford to regain some impetus and bag a couple of quick scores, although the overall outcome was never in question. Sircar was the next to go in from deep after some quick phase play. He swept down the wing and made amends for his earlier error with a cracking score. Lomas missed the conversion from out wide. By now, it was showtime for Buxton, with the cup very much in sight, and a memorable match was finished off fittingly by skipper de Groot, who smashed over for a try that was converted by Lomas. After the game, proud coach Karl de Groot said: “I am so pleased for the guys. It’s been a tough season, so to pick up such a prestigious trophy from NLD Finals Day rewards them for their efforts, especially as it’s a trophy the club has never won. “This makes the current player group the most successful in the club’s history, which is a tale to be told in the future, no doubt.